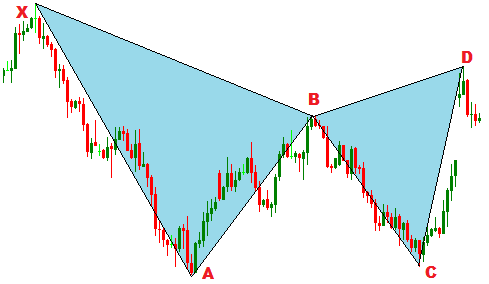 Bearish Gartley harminc chart pattern confirms or suggests a short entry upon completion of the pattern. 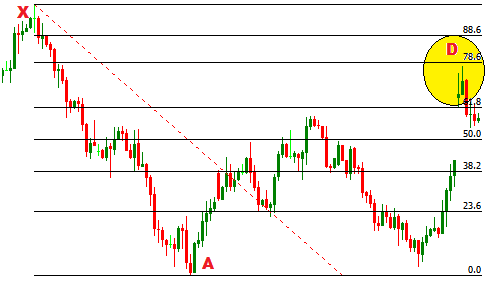 This post is to explain the way to draw a Bearish Gartley harmonic chart pattern, and the way to apply the Bearish Gartley harmonic chart pattern in forex trading. Firstly, let's start to draw a Bearish Gartley harmonic chart pattern. 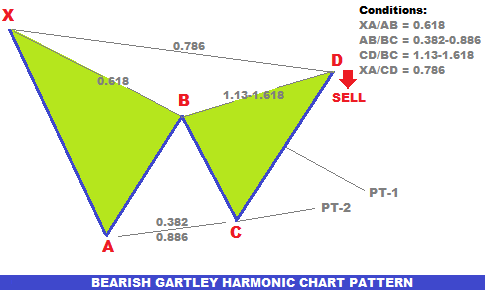 How to draw a Bearish Gartley harmonic chart pattern? To draw a Bearish Gartley harmonic chart pattern, firstly, we need to find the X and A points of the pattern. X is found at the top of a strong bearish trend, and A is found at the bottom of a strong bearish trend. In second step we drawn a fibonacci retracement starting from point X to point A to find the retracement at point B. The XA/AB=0.618 confirms the B point of the Bearish Gartley harmonic chart pattern, and it can be found at the 61.8% retracement level of XA. In the image below the B point is lower than the 61.8% fibonacci retracement, but if we carefully look at the X candlestick, we can see the price were not stable at the top of the candle, and opening and closing price were almost similar. In such cases, we can consider the stable price little lower than the top of the candle. So point B little lower than the 61.8% fibonacci retracement is okk. In next step, we are to confirm the point C of the Bearish Gartley harmonic chart pattern. To find the point B let's draw a fibonacci retracement tool from point A to B. AB/BC=0.382 to 0.886 confirms the point C, which is at the 88.6% of AB. In this step, we are to confirm the point D of the Bearish Gartley harmonic chart pattern, which confirms the completion of the pattern. We have drawn a fibonacci retracement tool from B to C. CD/DC= 1.13 to 1.618 confirms the point D of the pattern. We can see in the image blow that the point D is between the 1.13 to 1.618 range. To find the point D exactly we will reconfirm it in the next step. To reconfirm the point D, we will draw a fibonacci retracement tool from point X to A. XA/AD= 0.786 confirms the point D, clearing the confusion arisen in the followed step. Have a look at the image below. In final steps, we will just draw the XA, XB, AB, BC, BD straight lines to find the Bearish Gartley harmonic chart pattern. 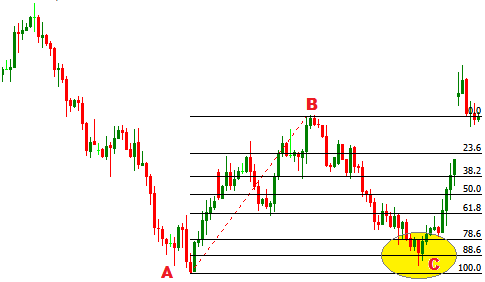 How to trade the Bearish Gartley harmonic chart pattern in forex ? Trading the Bearish Gartley harmonic chart pattern is simple. General rule is to place a short order when the point D is confirmed. The profit target for the order placed at point D should be at the 50%, 61.8%, or 88.6% retracement level of CD, or at the AC trend line. 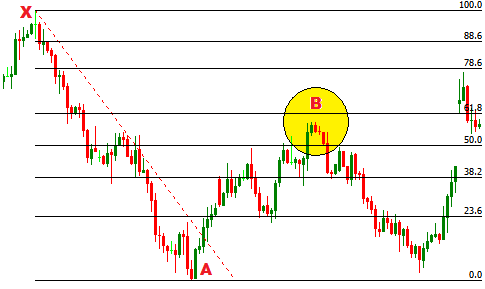 Stop loss for the order at point D can be placed at point X price level. Smart traders also take the advantages at other points. If you have adequate knowledge of using other technical tools, fundamental analysis and sentiment analysis, you will surely be able to place orders at other points. In our later posts, we will try to explain the way of trading every points in harmonic chart patterns. Dear Traders, hope this post will enrich your trading knowledge. If you want to join the discussion with other traders, you can drop a comment below. You can also subscribe yourFXguide with you email address to receive the updates.